If you don’t have a child safety fence surrounding your pool, there’s a chance it’s still incredibly unsafe during colder months. You’ve already closed up the pool for the season, but that doesn’t mean your pool isn’t accessible. If you don’t have a child safety fence surrounding your pool, there’s a chance it’s still incredibly unsafe during colder months. Without the proper precautions, your pool can present huge dangers that put your children and pets at severe risk. To prevent that, read on to see why a child safety fence is perfect for your family. The second leading cause for children’s death is drowning. But despite that staggering statistic, many people ignore the safety surrounding their pool. Leaving a pool without a fence or with a flimsy cover can leave it open for children to fall in. This early in the season, the pool probably hasn’t frozen over. But even when it does, children could break through the ice and be trapped underneath. 2. Gives peace of mind. While a safety fence is certainly not a substitute for parental supervision, it’s an excellent alternative if you must take your eyes off your children at any point. During the winter, kids go outside to play in the snow, and you may not want to stay out there with them in the frigid cold. So, if you’re suspecting you may not be able to keep a close eye on them, a safety fence will keep them protected for that short amount of time when you look away. An added benefit is that a safety fence can also keep out wildlife! 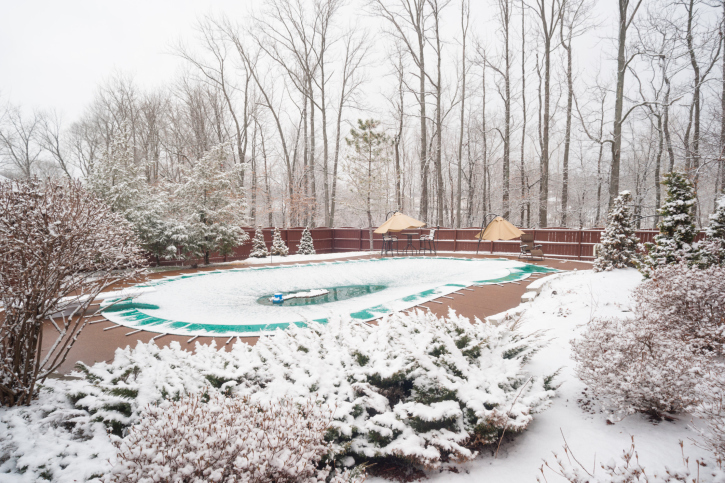 Pools often attract animals, and during the winter, they can get stuck in the pool and freeze. With a fence you can avoid this situation entirely. A great way to protect your pool from wildlife is to install a fence, but you can also couple that with a durable pool cover. Need a child safety fence for your pool this winter? Call Mid-Atlantic Deck & Fence! Mid-Atlantic Deck & Fence has almost 30 years of experience in building beautiful custom fences and decks throughout the state of Maryland. We have the expertise to design your dream fence or custom deck and have it installed in a headache-free process. Give us a call at 1-800-833-9310 or visit us online for a quote today! We offer many different styles of fencing and decking in addition to custom options designed specifically to suit your preferences and tastes. To see examples of our work and get more tips on how to choose the right fence for your family, follow us on Facebook, Twitter, Houzz, Pinterest, Google+, YouTube, and LinkedIn.